Clan Scholae Palatinae is one of the original units of the Dark Jedi Brotherhood and one of the first that had been made into a Clan in 19 ABY. Independent and proud, today, it plays the game of thrones to become the ruler of the Caperion System, its dominion-to-be. It traces its roots back to Emperor Palpatine himself, and rules its territory in the Caperion System as a tribute of the Great Empire he built. The Empire, although small, is an important and historic force within the Dark Jedi Brotherhood. During the reign of the Galactic Empire, Emperor Palpatine tasked specific Dark Jedi within his intelligence division to serve as guards to the greatest secrets and storehouses the Empire had. They would be known as the Emperor's Guards. After the battle of Endor, the intelligence division lay in partial ruin. When the Emperor's Hammer Strike Fleet formed out of the collapsing Empire, intelligence on the Emperor's Guards were salvaged and from this new information a new unit would be born. This unit was House Scholae Palatinae. Scholae Palatinae quickly gained many members, attracting those who valued the secrets of the dark side, and even some of the light This influx of membership allowed the House to be formed quickly into a Clan, bringing with it three houses below it; House Dorimad Sol, House Acclivis Draco, and House Caliburnus. From this membership, Clan Scholae Palatinae was able to obtain the Victory-class Star Destroyer Excidium and a Modified Corvette, Victory. With these new ships, Scholae Palatinae was able to move from their increasingly harsh world onto a world that was better off, keeping itself alive. However, the liveliness would be in vain. The Star Chamber decided to destroy Clan Scholae Palatinae for reasons that have never been fully revealed. While the members of Caliburnus had been decimated, the members of Dorimad Sol and Acclivis Draco were placed into Clan Arcona and had dangerous experiments were performed on them. Soon after though, it was discovered House Caliburnus had not been destroyed and was a thriving society instead. Surprising the Star Chamber, Caliburnus was allowed to regain its former members and given the ability to rebuild Clan Scholae Palatinae again. Thus ended the first Great Jedi War for the Clan, and the beginning of Scholae's hatred for Arcona. Outside Clan Scholae Palatinae, the dark side was changing. The Star Chamber had rumblings of change, and the Emperor's Hammer Strike Fleet was slowly become corrupted with greed and power from the inside out. Rumors of "unfortunate accidents" and strange power plays consumed the dark corners of the Dark Jedi Brotherhood. Inside Scholae, similar events occurred. Apprentices and other Journeymen were chastised quicker, and punished frequently. Equites were given either nothing to do out of spite, or many things to do out of malice, But the leadership knew what was going on. Thus would begin the Exodus. The Seven along with most of the Dark Jedi Brotherhood would help evacuate all of its holdings along with most of the loyal members. And when they left their system, they demolished everything behind them, as to make sure the Emperor's Hammer could not find out where they went; the Shroud. And for Scholae Palatinae specifically, the Cocytus System. Over the next many years, Clan Scholae Palatinae would enter or be pulled into many conflicts to aid the Dark Jedi Brotherhood. During the War of the Star Chamber, Scholae was influenced by a corrupted Jac Cotelin, but they were able to reclaim their honor. During the Third Brotherhood Civil War, Scholae would unite reluctantly with Clan Arcona and Clan Taldryan to defend against an exact clone of then Grand Master Jac Cotelin. But it would be during the military preparedness exercise, Second Darkness, that the Clan would finally get its long time revenge on Clan Arcona. During the victory celebrations, the Yuuzhan Vong had entered Brotherhood space. It was during this time that Consul Braecen Kaeth had fired upon the Arconan vessel, Eye of the Abyss, in order to leave it as fodder for the Brotherhood's escape. But the Arconans, instead of going back to their own system, attempted to regroup and tow themselves to the Cocytus System in order to conquer it from a weakened Vong and Clan Scholae Palatinae. Although fighting did occur, the Vong were overwhelming. Clan Arcona and Clan Scholae Palatinae both had to fight off the Vong in an alliance of sorts in order to save themselves and escape to the Shroud. It would be during the following months that each Clan would attempt to take back their systems from an overconfident Yuuzhan Vong. The Reclamation of Judecca was an official retaking of most of the Cocytus system as well as Judecca, the Scholae base planet. Under Grand Master Sarin, the Dark Jedi Brotherhood was united and was tasked with taking back Antei. Clan Scholae Palatinae was given both the tasks of clearing out the Shroud as well as landing Dark Jedi ground troops in order to attack specific locations. Scholae knew going through the Shroud would mean definite casualties, but the Grand Master and Clan Arcona thought of it as justice for the disabling of Eye of the Abyss. However, when the Brotherhood arrived at Antei, the Vong were utterly destroyed by a Jedi Master known as Omancor Crask. Him, his students, and many war droids fought off the Vong and claimed Antei as their own. The original plans were still in place, but now the Dark Brotherhood would be fighting off rogue Jedi. Scholae aided in the defeat of the Jedi as well as the reclamation of different special places on Antei. Many different conflicts erupted after the events of the Yuuzhan Vong and Crask. The Dark Council tasked the Clans in killing the Killiks on Salas V. The victor, who would end up being independent House Revan, would claim ownership of the planet. When a rogue Grand Master Zoraan arrived to attempt to retake the Brotherhood, Clan Scholae Palatinae had helped to fight off the former Grand Master, and when the One Sith attempted to destroy the Brotherhood shortly after from the inside, Scholae aided Grand Master Muz Ashen in his crusade against the One Sith, claiming the planet Korriz in the process for themselves. However, Muz Ashen had also attempted the Rite of Immortality, destroying Antei in the process and almost destroying Korriban. However, in the middle of the Dark Crusade, the Cocytus system went through some troubles. The government of the system saw an opportune time to take over the monarchy and establish a personal dictatorship. With the aid of Imperial Intelligence and Battleteam Caliburnus, Emperor Xen'Mordin Vismorsus was able to assassinate the rogue leader and his followers as well as establish a new order in the system severely loyal to the Consul and Dark Jedi of Scholae Palatinae. In the destruction of Antei's surface, the surviving members of old enemies came out from the shadows. Old members of the Cause, people who had spied for or worked with the Yuuzhan Vong, or those who believed in the corrupted teachings of Jaac Cotelin, the One Sith, or former Grand Master Zoraan had come together to form a militia that would attack the Cocytus system (the first in a long line of systems they wanted to cause destruction in). However, the Clan united and easily put a stop to the terrorist threat. Under Emperor Xen'Mordin, Clan Scholae Palatinae went through a mass restructuring after all these crises, remodelling itself to further reflect the ideals of the Galactic Empire, abolishing the monarchy entirely. The current battleteams were absorbed into the Clan structure itself and new Houses were established; Excidium and Imperium. House Imperium gained a battleteam by the name of Shadow Guard, with battleteam Acclivis Draco remaining a separate entity within the Clan. The Scholae Empire, modelled on the workings of Palpatine's Galactic Empire is the frontal governmental system operated by Clan Scholae Palatinae. The Scholae Empire is public knowledge to inhabitants of the Caperion System, while the Dark Jedi clan, the shadow government, operates in the shadows, unknown to all but the top military, economic and political leaders, those who are familiar enough with the Empire to know that disclosing its secrets is unwise. Currently, the Clan's only territory is the City of Caelestis, the biggest city on Ragnath. Headquartered in the City of Caelestis, the Imperial Government is led by the Emperor of the Scholae Empire. The Emperor rules de facto over the territory claimed by the Scholae Empire. The appointed officers, and below them the Senate, help alleviate some of the duties of the Emperor. Advisors within the Imperial Palace handle the functioning of the realm so that the Emperor has the time to direct and control as he wills. The Emperor of the Scholae Empire and the Consul of Clan Scholae Palatinae form a singular role. While this subjects the system to more frequent changes in Emperor, it is not enough that it causes major alarm for the citizens, who fear the title more than the man himself. These leaders became known as the Tyrants. It is the Tyrant of the Clan who rules as the public face of the system, totally intertwining the fates of both the system and the Clan to the politics of the Brotherhood, without ever making its presence known. The most powerful of these appointed officials is the Grand Vizier, who is widely seen as the second in command of the territory. The Grand Vizier is always an experienced Brotherhood member who is capable of accepting the responsibilities of maintaining home security in addition to the role of Proconsul. While the public still recognizes the Emperor's direct authority over the politicians of the system, it is the Grand Vizier who keeps them all in line per orders from the Emperor. It is the Grand Vizier who will stand in to lead the clan and the empire if the reigning Emperor is unable to fulfil their duties. In the Galactic Empire, this position was held by Mas Amedda, the right hand of Emperor Palpatine. The current Grand Vizier of the Scholae Empire is Braecen Kaeth. The second crucial position beyond the Emperor is that of Grand Admiral. The Grand Admiral is the structural keystone to keep all of the government running. Ultimately reporting to the Emperor the Grand Admiral is utilized as the main controller of all the clan military. The Grand Admiral is the one who mobilizes the system’s forces every time there is an attack, either from out of system or from within. While many like to believe that the police force is an independent force, they too are ultimately under the control of the Grand Marshal.Coupled with the fact this position also deals with the duties of Clan Rollmaster, the Grand Admiral plays a very important role to ensure that both the Clan and system continue to function. The current Grand Admiral is Mune Cinteroph, the master of both the current Empress and Grand Vizier. The Imperial Senate, comprised of Dark Jedi members of Clan Scholae Palatinae and civilian politicians, is an advisory body to the Emperor. Members of the Imperial Senate meet regularly to discuss various matters, which have crucial meaning for functioning of the Empire. However, the Scholae Empire is not a democracy and The Imperial Senate has no power to make any real decisions. It may provide opinions on certain matters or its own ideas for bills, but they still need to be reviewed and approved by the Emperor himself, and are frequently overruled. Nevertheless, the Senate serves the function of making people think that they have an influence on how the Empire is ruled. Galactic Goods: The Scholae Empire has a better understanding of the Galactic economy than its neighbours in Caperion, housing members from all across the Galaxy. As a result, it knows where to find all the best stuff. Scholae Palatinae maintains a healthy trade partnership with its neighbours by purchasing luxury items from across the galaxy and selling them on to Elaya, the UCE and Nayama for a profit. Military Protection: The military force of Scholae Palatinae can compete with the strongest forces in Caperion. As the military is rarely fully engaged due to its primary enemy being occupied on many fronts, there is spare capacity within the Imperial Scholae Navy and Imperial Scholae Army to provide support to its neighbours, for a fee. Points of Interest: Caelestis City was the jewel of the Meraxis Empire, a technological masterpiece, and now belongs to Clan Scholae Palatinae. Under Meraxis control, the city was extremely difficult to visit for any non-Meraxis citizen, and always had an air of mystique about it. As Scholae Palatinae maintains friendlier relations with its neighbours, the city, as well as the natural beauty of the Nethal Archipelago, is now open for tourism. Scholae Palatinae maintain a fabrication of Meraxis culture and museums of its own history to encourage tourism from its allies. Health Tourism: Tipoca Station is a state-of-the-art hospital in space allowing for up to 80.000 patients to be treated at once. That is more capacity than Scholae Palatinae’s navy crews, ground forces, auxiliaries and Clan members combined could occupy, or not far off. The surplus capacities are privatised and used by citizens of the Scholae Empire and its allies for those who can afford the best healthcare the system has to offer. Frequently, this is used by wealthy businessmen from the United Corporations of Elaya. Taxation: Caelestis City, due to its technologically advanced state, houses many big businesses and is the home to many rich and famous individuals. As a result, gross domestic product is very high, and Scholae Palatinae exploits this using a high taxation rate of its people. Loans: The move to Caperion was expensive for Scholae Palatinae, but it has found itself a home with some rich individuals. As a short term economic plan, Scholae has encouraged its citizens to loan some of their personal wealth to the empire in exchange for Imperial favour. If some of these people, and their descendants, mysteriously disappear one day, all the better. Mining on Balaerion: The Meraxis Empire have long held a prison mining colony on the icy world of Balaerion. Scholae eventually plans to take control of that colony, and hijack the trade of the raw materials, to boost its economy. Other Clans: Scholae Palatinae also hope to establish a military alliance and trade partnership with another clan in the near future. Clan Scholae Palatinae is the shadowy organisation, mostly of Dark Jedi, that uphold the Empire in secrecy. Their existence is only known to a select few that can be trusted to have the wisdom not to leak confidential information. Led by the Consul, also the Emperor of Cocytus, and supported by the Grand Vizier(Proconsul) and the Grand Admiral (Rollmaster), Clan Scholae Palatinae is divided into two forces, both equally important arms of the Empire. Imperium enforces Imperial rule within the laws of the Empire, while Excidium operate entirely within the shadows as they perform tasks that the Emperor cannot be associated with. House Excidium is known for their wild cards of dubious character, some even outright criminal, but this is exactly what Excidium needs to watch over the Scholae Empire. This group uses a wide variety of skills to ensure that the Empire is protected from internal and external threats that the Clan either can’t see or can’t fight due to more delicate reasons, such as politics or public image. As a result, it is publicly disassociated from the Clan itself and its loyalties may appear to be less than dependable, but in reality its fealty is to Cocytus Empire above all else. House Excidium houses Tacitus Athanasius. A secretive group, the battleteam serves as a silent dagger to enemies of the House and its leaders. Very little if known of the unit to the outside world, and secrecy is one of its most deadly weapons. The members go after mostly special targets, and take out possible threats that remain hidden in the shadows. As the name says, they are the silent death to all who oppose the House, and by extension the Scholae Empire. Excidium’s less subtle and more action-hungry members are concentrated in Vindictae Immortalis. The unit is involved in gang wars, heists, abductions, sabotage, and other high-profile operations which draw attention away from the Empire’s activities. House Imperium is know that lay back and view things from afar. They have patience and care for knowledge and the context within a conflict. To Imperium, combat on the front lines is important, but what happens behind the lines is even more important to Imperium. When war breaks out, Imperium will be the first to know and the first to lay out a plan. In relative peace, they perform more operational duties. Members of Imperium can fight boldly when necessary, however they would rather define themselves by their ability to overpower the enemy through forethought and knowledge. What drives them is understanding; knowledge in the world around them and knowledge in the eyes of others. Battleteam Krennic is the more military-minded arm of House Imperium's battleteams. They carry out duties similar to special teams forces. When there is a high-value target that needs to be attacked, an enemy that needs to be captured or taken out, or something just needs to be done quickly and effectively, Krennic gets sent in to do the job. They go in, take care of business, and get out - making sure to be as efficient as possible in their work. Battleteam Pellaeon is part of the military intelligence arm of House Imperium. Officially, members of Pellaeon source and evaluate potential threats to the house through use of covert operations and intelligence gathering. Unofficially, members have been suspected of much more proactive "assignments" against the enemies of House Imperium. Former Battleteam and House within Clan Scholae Palatinae. It has become a tradition that the Consuls of Scholae Palatinae be given a secondary title as a description of their personality. These titles are not given lightly and are earned by the actions and demeanor of each. After their reign has finished, the title remains in the history books as the legacy of what their rule brought to the system. The military of the Scholae Empire is broken into three elements: the Imperial Scholae Army, containing the clan's ground forces, the Imperial Scholae Navy, containing its ships, and the Imperial Scholae Intelligence, consisting of spies and data analysts. Each branch is highly regarded for their skills in warfare; though, each element is uniquely different in the way it is deployed and managed. As a combined force, they are designated The Military of Scholae Palatinae. Based on Imperial rule and tradition, the divisible elements can be positioned and commanded with greater ease. Presiding as Overlord of the Legions & Clan Fleet is the Emperor’s Right-Hand: The Grand Vizer. This is the highest rank one can attain within the Military, short of being the Emperor himself, and is seen as the Chief Military Expert and Leader within the clan. The clan military operates two ranking systems, one for the navy and one for the army. The army ranks are identical to the loyalist ranks of the Dark Jedi Brotherhood. This provides an equivalence between the Dark Jedi ranks and military ranks. The members of Clan Scholae Palatinae do not have permanent command of specific units, but can commandeer sub-units of the military for specific purposes in accordance with their rank. For the Army, this begins with commanding fireteams of 3-4 troops at the Journeyman ranks, up to entire regiments at the upper echelon of the Equite ranks. In the Navy, Dark Jedi of the journeymen ranks can take brief command of fighter flights, and command destroyers at the upper Equite ranks. More detail is available in the main pages of the Army and Navy. The ISA comprises of the collective identity of the entire Clan ground forces: the front line soldiers, scouts, special forces, vehicles and heavy armour. The ISA is made up primarily of The Imperial Legion, a versatile fighting force used for both attack and defensive operations, and the Imperial Scholae Guard Regiment, a smaller unit dedicated to the defence of Scholae territory. The ISA works closely with Imperial Scholae Intelligence in operations planning. The largest unit within the ISA is the Imperial Legion. The Imperial Legion makes up 80% of the army. Mostly stationed on the capital ships of the Imperial Scholae Navy during warfare and in the home territories other times, The Imperial Legion provides both offensive and defensive duties to the clan. The Imperial Legion contains over 5500 military infantry, 20 artillery lines and 18 tank platoons, as well as air support, special forces and scouting units. The remainder of the Army is placed in The Imperial Scholae Guard Regiment. This regiment is tasked only with the protection of the clan dominion and never venture outside. Formerly, their task was the protection of the entire Cocytus System, with one Battalion dedicated to each of the system's four planets. Due to the instability of the clan's current territory, division of tasks among the Battalions is constantly in flux, but their role of the protection of the clan's assets has never changed. The Guard Regiment contains 1368 infantry and 12 armour platoons. Mercenary forces will also frequently fight alongside the Imperial Scholae Army. During the Twelfth Great Jedi War, an army of Nayaman Mercenaries were purchased to support the ISA in the fight against The Collective. The ISN comprises of the collective identity of the entire Clan naval forces: the large warships, starfighters, and accompanying personnel. The ISN is made up primarily of two flotillas, a fleet of ships, which are each comprised of a collection of destroyers, cruisers, frigates, corvettes, assault craft and starfighters. 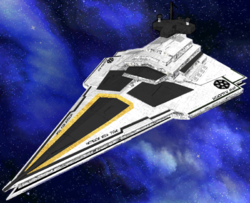 The flagship of the Emperor of Scholae, the ISN Sidious, and the flagship of the Grand Vizier, his right hand, the ISN Vader, lead the first and second flotillas respectively. In addition, a third, smaller flotilla, under the command of the secret House Excidium, disguised as a criminal organisation, is officially unaffiliated with the Scholae Empire and used for infiltration and subterfuge. The Imperial Medical Station, the IMS Tipoca II, falls under the umbrella of the ISN. The First Flotilla is the largest of the flotillas in the Imperial Scholae Navy, and is primarily tasked with the defense of the Scholae Palatinae dominion. The Flotilla contains the most powerful warship in the navy, the Victory-class Star Destroyer ISN Sidious. The ISN Sidious is the Flagship of the Emperor, and serves to house the officers and top leadership of the Scholae Empire as a centralised mobile command centre. Smaller than the First Flotilla, the Second Flotilla is primarily tasked as the lead spear and offensive unit deployed into conflict. The Flotilla contains the largest carrier in the navy, the Venator-class Star Destroyer ISN Vader. The ISN Vader is the Flagship of the Grand Vizier (Proconsul) of Scholae Palatinae, and the centrepiece of any major attack, as well as a centralised mobile command centre. As consul, Elincia Rei sold off some of the clan military to allocate funds for the houses and battleteams to possess their own forces. The sub unit militaries are under the supreme command of their respective unit leader, and do not officially fall within the clan military structure, although can be called upon if needed. The Imperium force primarily functions as a homeguard unit, with a battalion of line infantry and artillery for a line-holding function and a battalion of scout, assault and drop troopers in a search and destroy unit. They also possess a Raider I-class Corvette for heavy firepower and a Quasar Fire-class Cruiser Carrier loaded with fighters, while each battleteam (Krennic and Pellaeon) operate from a Marauder-class Corvette. The Excidium forces are officially unassociated with the clan, and perform operations in which the Empire cannot be associated with. They primarily operate from a Raider II-class Corvette, with a Marauder-class Corvette and a Minstrel-class Space Yacht in support. The chaotic Vindictae Immortalis are based upon a Marauder-class Corvette, while the assassins of Tacitus Athanasius make a Raider I-class Corvette their home. Scholae Palatinae does not control the entirety of the Caperion System in which it resides, but has been expanding its influence from Caelestis City, on the moon of Ragnath. The map above shows the current political borders of the moon. Massive corporations that once called Caelestis their home have been welcomed into the Scholae Empire as it tries to maintain the thriving economy of the city. The rich and famous who resided in the city have been offered citizenship and political favour in exchange for financial donations to the Empire. The commonfolk typically live in high rise apartment blocks, and benefit from a high standard of living in the city. Adoniram Tower: Adoniram Tower was commissioned by the Emperor of Meraxis, Adoniram, as a symbol of his rule, power, and the wealth of Meraxis. Since taking over Caelestis, Scholae Palatinae took the building, which towers over the rest of the city, as their headquarters. As an insult to Adoniram, they kept the name, with the only modification being a giant emblem of Clan Scholae Palatinae plastered on the side. Scholae Palatinae uses the building as the offices and personal residence of its top command, and is central to the management of the empire. The Lighthouse: Located in the harbor of Caelestis City and rising from the tides without a rock in sight, the 250 metre tall lighthouse is a beacon of safety for seafaring vessels. For anyone else, it is a frequent and infamous place to carry out feuds under Meraxis' Code Duello. The most popular choice is the top-level platform, fifty meters wide and open to the elements, save for the tall transparisteel cylinder protecting the torch. There is no barrier around the edge of the platform to prevent a 250 metre fall into the waters below. However, robust Meraxian engineering has hardened the critical components of the lighthouse in such a fashion that the whole building is open for battle, provided the duellists sign off on funding repairs. It has become quite an attraction for the local populace to watch the duels unfold from the harbor or from tall buildings. Once home to quiet fishing villages, the Archipelago was torn apart when Scholae Palatinae took over Caelestis and then marched on the islands. Most of the fishing communities have been displaced and are hesitant to return to the islands. As a result, due to its natural beauty, the island chain has been repurposed as a tourist destination, with memorials to recognise the losses on both sides of the battle. Venenum was the first planetary step for the people of the Caperion system. Due to its elliptical orbit, and depending on its relation to the orbit of Seraph it can become the closest orbiting planet. In a rare sign of solidarity between the major political powers of Seraph, Venenum was to be home of a cross cultural colonization effort. However, underestimating the extreme environmental shifts on the planet, along with the strength of the acid rains on the planet as it moves further from Caperion, the colonization effort failed, leading to the deaths of over 25,000 individuals from all political parties of Seraph. 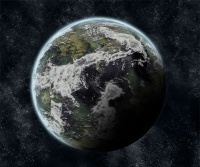 Seraph is the only planet in the Caperion System ideal for harbouring advanced sentient life. Perfect for life to flourish, Seraph contains a variety of terrains, including desert, mountains, plains, jungles and icy polar regions, as well as large oceans of fresh water and a breathable atmosphere, as well as almost standard levels of gravity. Temperatures on Seraph range from 0 to 30 degrees Celsius, depending on latitude and season, with a year length of 450 standard days. Seraph has a variety of animal and plant life forms, including its own indigenous species and those more commonly seen across the galaxy that have been brought in from off world. The planet is home to five major political groups that fight over power, and is heavily populated with cities, towns and villages, home to 3.7 billion people, 80% of which are human. The Meraxis Empire and the Democratic Republic of Elaya possess the largest territory, with the Republic being the main thing stopping the Empire from dominating the rest of the planet. The United Corporations of Elaya are a hugely rich independent faction occupying a single city and possess the majority of the wealth in the system. The remaining two factions are the Nayama Dynasty, an arts-facing culture, and The Republic of the Force, a theocracy that worship the Force and those who control it. The nature of the core of the planet is completely unknown. Its gases are thick and heavy. Particles suspended in the gases are charged in the planet’s rapid rotation and the gases stormy movements. These charged particles have left the planet in a perpetual lightning storm. The thick gas however masks the lightning from orbit and beyond, only noticeable once you break the outermost layer of gas. Balaerion is a freezing cold terrestrial world of barren frozen wastes. The surface is 96% nitrogen ice with traces of methane and carbon monoxide. Beneath the surface of frozen nitrogen is a thick layer of water ice. The crust is comprised of two tectonic plates, bordered on a great circle perpendicular to the equator. Frequent earthquakes along this line have been known to shatter the surface down to the crust. Within the crust lie valuable resources essential for artificial gravity generators and electronics. Scholae Palatinae ruled over the entire Cocytus System until it was destroyed by the Iron Fleet of Darth Pravus and the clan fled to the Caperion System to establish a new home. Its natives were largely primitive and tribal and bent to the wishes of the Empire's superior technology and Force Powers. While the Empire swiftly took control of the 6-planet system shortly after the Exodus, they faced numerous uprisings throughout their rule from the capital world of Judecca. The Cocytus System was home to many Rakatan artefacts dating back to the Infinite Empire which inspired many of these failed rebellions. 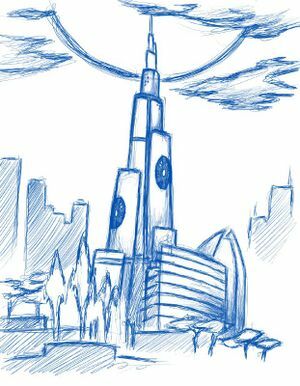 Judecca, based in the Cocytus System, is the home planet of Scholae Palatinae and its capital city is Ohmen. It is thought to have been the first planet formed in the System after its star, Imperius, was formed and it has a temperate climate with varying geographic features. The three historical houses of Scholae Palatinae: Acclivis Draco, Dorimad Sol, and Caliburnus, made their homes on the desert world of Antenora, the frozen world of Caina, and the jungle world of Ptolomea respectively. On the outer edge of the system was a gas giant, Iblis, and a desolate mining colony on Vassago, but these planets were not frequently used by Scholae Palatinae. The Democratic Republic of Elaya - An unlikely ally due to the opposing political views between democracy and imperialism, Scholae Palatinae assisted Elaya in its war against the Meraxis Empire, presenting itself as the best way to turn the tides in the war. The two maintain an uneasy alliance, as Elaya appreciates Scholae's support against its long-term enemy Meraxis, but are uncomfortable with another Empire gaining power in the system. Elaya possesses a military strength comparable to Clan Scholae Palatinae but vastly superior territory. They keep themselves well guarded against any opportunistic betrayal from Scholae Palatinae. The Meraxis Empire - Ruled by an ambitious tyrant focused on conquering the whole of the Caperion System by squashing all in its way, the Meraxis Empire will never accept Scholae's presence in the system as anything other than an insult, especially after they have taken the side of Elaya. 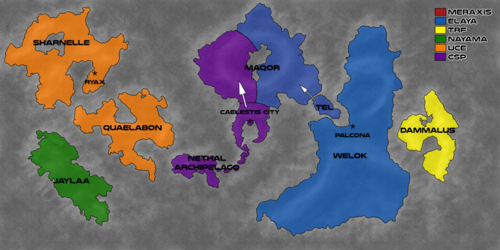 Further, Scholae's only territory in the Caperion System, Caelestis city, was previously the jewel of the Meraxis Empire. Meraxis has allied itself with The Collective on the basis that they both hate Scholae equally as much. Meraxis is similar to Elaya in its military power and territory. Clan Tarentum (extinct) - Neutral in the past, Tarentum delivered a major political blow during the Sixth Great Jedi War. This action sent a shockwave through the Royal Clan and began a time of strife that nearly ripped Scholae Palatinae apart. Due to this, Scholae Palatinae has been incredible cautious in dealing with Tarentum. Efforts to repair relations between the Clans have all failed within days. Clan Tarentum has now been closed by the Dark Council, and some of its elders subsequently joined Clan Scholae Palatinae. Deeply loyal to the ideals of the Empire, any threat to its stability can begin to turn the gears of war. Historically over aggressive, perhaps due to the roots in being Guards to the Reborn Emperor on Byss, Scholae Palatinae will go to any lengths to define the Empire. Loyal and Strong-headed, these traits have lead to troubles for the Royal Clan on more than one occasion. The overly- aggressive nature has faded over the years, with greater emphasis being put on rational and reasonable approaches to what serves the Clan best, whether that be combat or diplomatically. Aside from defending the Empire when needed, the Royal Clan is far more prone to sit in haunches and review the current situation of either the Brotherhood or abroad (Imperial Sector, New Republic, etc.). Once a deeper understanding of the situation is obtained and potential weaknesses are found, The Disciples of Palpatine will delve into the conflict with every fiber of being. Nothing is ever attempted halfway; Scholae Palatinae will give its all or not go at all. Known to isolate itself, Scholae Palatinae has a long history of closing its borders to outside influences at the first sign of trouble – internal or external – and begin the proper course of action that serves the Clan best. During times of stability, the Clan has become far more open to the rest of the Brotherhood seeing that there is strength in having allies, even it is to only advance the continuing security of the Empire. Once a pact of peace has been violated, Members of Scholae Palatinae react immediately with defensive measures and a retaliatory strike to show they are willing to defend themselves. While seen as over-zealous, diplomatic discussions can prevent the call for full on war. While this has drawn the Clan into direct confrontation several times, the Clan’s history is far more scattered with small retaliation skirmishes then full on conflicts. The Children of Palpatine are those who have been awarded the Clan Title, a rare and prestigious honor. These individuals have lead Scholae Palatinae or aspects of Scholae Palatinae with the highest level of honor and commitment, forever impacting the workings of the Royal Clan. These individuals have been involved with Scholae Palatinae, helping change it for the better. Their names should not be forgotten for the great work and example they provided for Scholae Palatinae.